Proper installation and maintenance are key elements in achieving best fencing results. It is the responsibility of the installer/owner to follow all guidelines provided by Cali Bamboo for success. 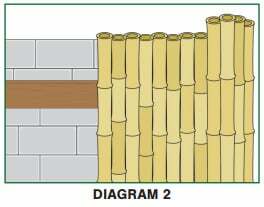 Always predrill the Bamboo fencing before attempting to fasten the fence to the studs. 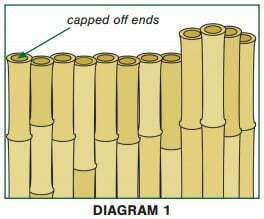 Cali Bamboo recommends fastening the Bamboo fence every 10th pole. Cali Bamboo recommends using screws made for outdoor use, solid decking screws tend to work the best. 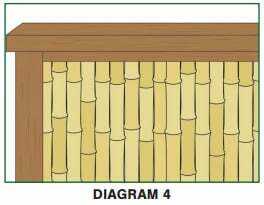 When installing Cali Bamboo fencing it is important to remember there are a top and a bottom side. The ends that are capped off are the top side (See Diagram 1). Always check with your local building code before the start of your project as building code supersedes all guidelines. Poles can be removed from fencing panel for a perfect fit (this will require cutting metal wiring). First thing you will need to do is install studs 1’ from the top and bottom of the cinder block/brick wall. You want to use a minimum of 1”x3” furring strip (2”x4” recommended) as your studs (See Diagram 2). Install studs horizontally along the wall. Always predrill then use concrete screws to fasten studs to cinder block/brick wall. Once studs are securely fastened you can start installing your Bamboo fencing. 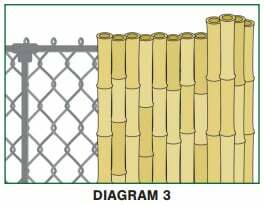 When installing over a chain link fence the recommended method to attach the bamboo rolls with zip ties. Zip ties should be used at least every 2’ along the length of the fence and at least 6” from the top and bottom of the existing chain link. See local Building Code for framing requirements. Once frame is complete you can now attach fencing. Always predrill poles before putting screws in. Please note: Above guideline is just that, a guide. Local building code will always supersede the guideline provided. It is up to the installer of the fence to follow outdoor building best practices for safety and best results.